On our second full day in Cochabamba, Jean Carla planned to take us to the Cristo de la Concordia, which is a huge statue of Christ in the eastern part of Cochabamba and overlooks most of the city. 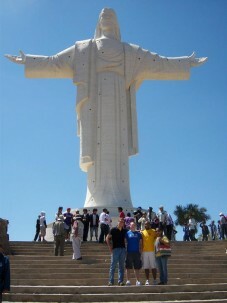 This is the second largest statue of Christ in the world. The largest is actually not the famous one in Rio de Janeiro, Brazil; the largest one is in Poland. In order to reach the statue, you can take stairs up the top of the huge hill, or you can take the cable car to the top. We definitely took the cable cars. Once we got off the cars, there were still a few more stairs to climb to get to the foot of the statue. These stairs were manageable though. At the top, I had a great view of Cochabamba. I did not realize how big the city is! The view of the city from the bottom of the statue was beautiful. I could see the mountains and hills that surround the city, and I could see Cochabamba sprawled throughout the valley. I’ve only been here three days; there is a lot more of Cochabamba I need to see. There are holes throughout the statue, which are windows. If we had more time, we could have actually climbed into the statue and looked out the windows to have an even better view of the city. Unfortunately, we didn’t have enough time and needed to get back home for lunch. I ate lunch at Jean Carla’s house with her family. I told her dad that I did not realize how large Cochabamba was. The city is spread out far, but it does not have many tall buildings. He told me that people prefer houses and yards, and that the taller buildings are only recent additions to the city. After lunch, I played with Jean Carla’s daughter and her bunny, Luna. Then, I played soccer and some Kinect games on X Box with her son. He beat me every time. Tomorrow, Monday, is an important day. We have our first Spanish lessons with Toni and our first classes with Vivian. Tomorrow we also figure out how to use public transportation here. It seems scary now, but I’m sure we’ll all get the hang of it soon. We’re also getting cell phones tomorrow. I’m excited just to be able to call the other Amizade students and make plans to do things with them! One thing I’m not sure about, though, is if it will be possible to talk with anyone from back home, and if I can, I have no idea how expensive it will be. Awesome pictures, Mikhael. Hope you get to go back the statue again so you can climb up! I’m sure your public transportation will be a great adventure. Looking forward to more of your blogs. Love you. Having read this I thought it was rather enlightening. I appreciate you taking the time and effort to put this short article together.